I've been on Sky Max for about a week, and have been sync'd at 6464/768 for the last 5 days. 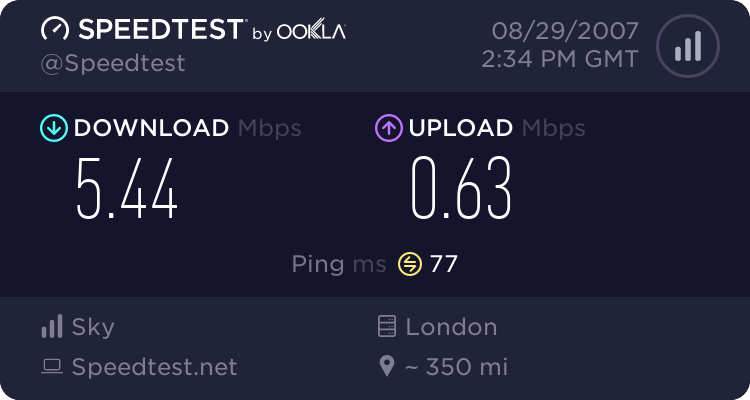 What download/upload speeds should I be seeing at this sync rate ? I understand that max doesn't quite work in the same way as "plain vanilla" ADSL, so no line profiles as such. Re: Sync speed vs download/upload speed (Max) ? 550k\s is reasonable when you consider times of day and bandwitdh available across the network etc. I think this conclusion is probably right but isn't the maths a bit dodgy? Have you checked your Attenuation and SNR figures? If you have just 'plugged in', and have not optimised your connection, there is a good chance you can do better. You usually find that your download speed will be about 85% of you sync rate, due to overheads. ie don't expect your sync and download to be the same. I was getting a similar performance with the supplied router, but the Netgear runs way too warm, and it would be sitting on a sunny window sill, so the Speedtouch is better for me.